Nojima sent out my new 4TB Western Digital Green hard drives (model number WD40EZRX) on the same day that I ordered them and Sagawa (that is a courier service in Japan) delivered them to me on the next day. Sagawa is always like that. I'm glad that Amazon doesn't use Sagawa. They came properly packaged to my relief. These were not bulk units so they came in their boxes. The first thing I noticed was how the boxes were ironically colored blue when the drives were from the Green series. In comparison, the 3TB drive came in a green box. The drives came in anti-static covers and were additionally protected by bubble wraps. My old 3TB drive didn’t come in a bubble wrap. I took them out and connected via the SATA to USB cable that I bought when I was troubleshooting the Asus UL20A years ago. First of all, I launched HDTune and checked if the drives didn’t have any errors. The Error Scan had to be rushed (i.e. I used the QuickScan) because I wanted to backup the data on the Toshiba drive as soon as possible. Both drives checked out fine. Then I started copying the data. It took a loooong time. Since the converter cable was only a USB 2.0 one, the maximum speed I could hit was 40MBps. I had about 2.5TB to copy. That took me 18hrs straight. And that’s just one drive. The other drive took pretty much the same time. I will post benchmarks of the new drives when I find time to install it directly through SATA. I am considering getting a USB 3.0 cable but I do not feel that spending more money is worth it. It is this initial backup that was taking so long. After that it won’t be that bad I bet. I intend to keep the Toshiba drive in the PC for a bit longer. Then I will see if I can sell it off price. In the last article I wrote how my Toshiba 3TB drive had developed errors and was facing potential death. While I did order new hard drives to replace it, I couldn’t take the risk of losing the important data (photos and videos of Japan, my kid and the wedding along with other important documents), I wanted to upload them to the cloud. Few months back Microsoft gave away 100GB of free OneDrive storage for 1 year if you were a Dropbox user and I was lucky not to pass on that offer. I even wrote about it on this site. So my OneDrive miraculously had 140GB of capacity. I decided to make use of that “free” space. First I organized the data I wanted to upload in the different folders, and copied them to the OneDrive folder on the PC. I had to do it in stages, but I finally managed to find about 137GB of high priority data. I synced them and I am glad to say that I could upload all of them to my OneDrive account within the day. I really love this internet connection! Up until now, I hardly used OneDrive. I always used Dropbox perhaps because Dropbox had an iOS app before OneDrive did. After all, it is because of Dropbox that I have this 100GB of free storage. Unfortunately, I would lose the ability to upload after February next year, but as far as I can understand, Microsoft will not delete the data even if I do not buy more storage. I would not be able to edit or add more data. I sure hope I can delete them and make the account functional again. But I hope I would have setup my NAS before that. I exhibited it on Rakuten Auctions and last Tuesday someone bid for it. Now I have to send the drive to him before next Tuesday and I started searching for portable drives. I did find some reasonably priced drives but unfortunately none of them came with the 240V support that I would require when I go back to Sri Lanka. For a second it felt as if proceeding to sell this drive was a mistake. I can of course refrain from sending him the drive but I would receive negative points and would cripple my chances of selling something in the future. So I am going to send it after all. That’s not going to change. Ideally, I don’t want any HDDs in my PC. I plan to equip it will only SSDs in the future but that would take many years. Technically though, I can do it right now too, because if I remove the Toshiba DT01ACA300 drive, which is currently installed inside the case (yes, that’s the faster of the two), the only remaining drive would be the Samsung 850 Evo 500GB SSD. Of course it would probably take decades for SSDs to catch up with HDDs in terms of capacity and price, so I cannot throw away the HDDs yet. I managed to transfer the components to the SG13 case on last Saturday morning while everyone else was asleep. It took me about 2 hours to get it up and running. The most difficult part was managing the cables with my 150mm PSU. If it was an SFX PSU or even an SFX-L PSU, I would have enough room. The cables were also quite too long for this build. Installing the HDD with all those cables was also quite a task. It is very tight in there. There are two options when it comes to cases for my Mini-ITX potential rig: the Silverstone SG13 and the Ncase M1. The Ncase M1 is the better case - feature wise as it supports 240mm radiators or even two 120mm radiators with lmost the same footprint as the SG13. The two radiator support will be ideal for those planning to buy an AMD Fury card with the AIO water cooling solution, with another AIO cooler for the CPU. The SG13 on the other hand will only support one 120mm AIO water cooler. However, the Ncase is very expensive. The case itself is $175 and I would have to order it online with a shipping cost of $35 and possible import taxes. Would come close to JPY 30, 000. On top of that, it "requires" a SFX power supply which results is a compulsory PSU change. The SG13 is only JPY6,500, and while it will work better with a SFX power supply unit due to extra breathing room for the components, it is not compulsory. So SG13 it is. Sadly. I wish I could have the Ncase. I sure hope that going cheap will not cause other complications in the future. So which components can I reuse from my existing build? PSU: Yes, as the Silverstone SST-ST75F-GS is a 150mm long PSU, however this would prevent me from having two SSDs in the front drive bay. That's fine since I would have a hard drive in there and it goes sideways so should fit. However, I would probably switch to an SFX-L PSU when I get the chance because they come with a larger 120mm fan which is important as the PSU would have to assist with exhausting the warm air out of the case. The one I'm looking at is the Silverstone SST-SX500-LG. SSD: Yes, but would have to be fitted on the floor if I'm using a supplementary hard drive. If I add more SSDs in the future they will have to go on top of the PSU (like Linus did in his 18-core CPU + Titan build in this case) and will have to mount them using "thin" double sided tape. HDD1: Yes, on the front drive Bay as mentioned before. HDD2: No, since the case supports only one HDD. However would make this a portable HDD or probably sell it and buy a proper portable HDD. Since this is the backup drive, it shouldn't have been installed inside the PC in the first place. CPU cooler: The Antec Kuhler 620, the cooler that I'm currently using, has short tubes and should fit in the case without issues. However, since the cooling ability of it has dropped reasonably in the past few years, I might consider changing this to a newer model at a later date. I don't have a specific model in my mind however it has to have short tubes. H80i-GT probably has the best radiator but it is expensive and I'm worried that it cannot cool effectively with a single fan. This needs more research but it is not a pressing matter so it can wait. Video Card: No, because the Gigabyte GTX 970 GAMING G1 that I'm currently using is too long. I was considering buying the GALAX GF PGTX970-OC/4GD5 MINI card which seems to come with a high boost clock and is quite short. However since I found out that the MSI GTX 970 Gaming card fits in there, I might opt for it for the sake of quietness. The GALAX card is quite loud at full load although it is no slouch in the performance department. I wish my original GTX 970 card didn't have coil whine. Had it been a defect less, I wouldn't have had to change the graphics card in the first place. To summarize, as a bear minimum, I'll have to change the video card. Of course I'll have to get the case too but that's obvious. Getting a portable hard drive case for one of the HDDs or replacing it with a portable hard drive would have to come next. Then it would be the time to change the PSU to one with an SFX-L form factor. Finally I might or might change the CPU cooler but it will be a low priority. As of writing this article, Amazon has listed the case as "imminent arrival of stock" with the lowest price I could find it at, so I placed an order. I have a couple of days before I can cancel the order though. So, someone finally wanted to grab my Asus Maximus VII Gene motherboard and I decided to purchase the Asus Z97i Plus Mini-ITX board. The reason for getting a Mini-ITX motherboard was to make my already small gaming rig even smaller. Well, not just smaller, but lighter too. One might think I am insane, but I have my reasons for doing so which I am not willing to disclose just yet. Sure, features wise it is sort of a downgrade. The old board had support for dual graphics cards, 4 DIMM slots, a much better audio solution (at least on paper) and better overclocking capabilities (again, on paper). Unfortunately, I am not willing to put a second graphics card or upgrade the memory beyond 16GB. My Core i7 4790K doesn't overclock high enough to warrant a better overclocking motherboard. It only does 4.5GHz without exquisite cooling which would be an easy feat for any Z97 board available. The only thing I would miss would be the audio chip. But I doubt that I would have any issues adjusting myself to the one on the Z97I-Plus board. I will probably feel that it sounds different, but not worse. On the other hand, the Z97I offers some important features too. In-built Wireless 802.11AC and Bluetooth 4.0 support is one. Better CPU socket placement with respect to the first PCI-E slot is another, although this would only be useful to people who want to install a large CPU cooler. It doesn't apply to me because I'm most probably going to end up with an AIO closed loop water cooling unit. The starting price I set for the board was quite high. JPY 20,000. I did not expect anyone to bid for that amount. I only paid JPY 3,000 more when I bought it. However the current selling price of the board is JPY 26,800 due to devaluation of Japanese Yen. And he eventually placed a bid. Since nobody competed against him for the board, the final bid was same as the starting bid. The guy paid for the board and I have to send it before 6th of June. In the mean time, it was time for me to look for a replacement. I love searching for new stuff to buy. The board comparable to the one I was replacing was the Asus ROG Maximus VII Impact. But it was quite expensive at around JPY 26,000. There were few more options too. The Asus Z97I-Plus, the Gigabyte Z97N Gaming 5 and the MSI Z97I Gaming ACK. Indeed, my options were limited. 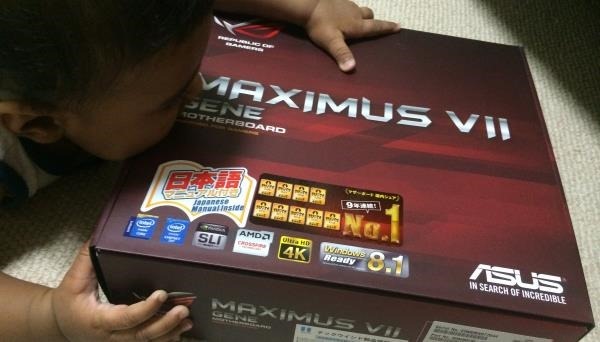 The Asus Z97I-Plus was the cheapest, priced at less than JPY 18,000 but it had one issue. The audio chip was the "old" Realtek ALC 892 chip. At least now there were better components such as audio grade caps to complement it, compared to the old Gigabyte GA-P55A-UD3 board I bought as soon as I arrived in Japan. The Gigabyte Z97N board was about JPY 2,000 more and it lacked a M.2 port. Although I don't current own a M.2 SSD, I might have to buy one in the future because if everything goes according to plan, I would not have enough space inside the case for lots of drives. The issue with the MSI board was its price. It was same price as the Impact and in that case the Impact would be the better option for the sheer amount of features it offered.